* harmonious integration of our spiritual, mental, emotional & physical body, breathing, body mechanics & intention. * Zhang Zhuang - standing meditations. On average, between 15 - 40 minutes per class is devoted to zhan zhuang. * Quiet mind, open heart embodied feeling awareness. * "Silk reeling" exercises which refine smoothness of consciousness & movement. * Slow, mindfully embodied exploration of harmonizing yin & yang energies via singular & short sequence movement flows. * Integrated / unified body movement. * Rooted, relaxed connection with the earth. Movement flowing from the ground up through the feet, legs, hips, spine - whole body. A common misconception about Tai Chi qigong & zhan zhuang I've noticed many people have is that it's just for elderly people. Unfortunately that assumption deters many people from engaging these practices - ways of embodied meditation until they are nearing the end of their life. Many people practice and teach Tai Chi in a super casual way & just repeat long preset forms & focus on preventing falls for elder people. However these arts can also be engaged, practiced & taught ( as I do ) with lower postures, longer zhan zhuang standing meditations, focused slower short movement flows to hone focus, foundational strength & principles rather than repeating the same long forms over & over like a musician who just plays a cover of someone else's song repeatedly. I began practicing these arts at age 17 consistently through my life. And I intend to continue until I transition out of this body. So if you are in your early 20s on up, these arts can still be positively challenging, enriching and worthwhile. of experiencing & exploring our embodying consciousness. Attuning to the quietly spacious feeling awareness of wuji - emptiness realm of being. which express and are experienced through balance & interplay of complementary aspects of being. 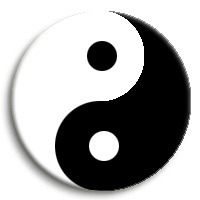 Also symbolized as yin & yang. Male and female. Inner and manifest. Etc. There is a natural energetic resonance of yin energy for beings born in female bodies. Just as there is a natural energetic resonance of yang energy for beings born in male bodies. Both energies are equally essential, natural and vital to harmonious existence in this world. Both have their healthy, honest and loving expressions. And both have their unhealthy, misleading passive aggressively & directly dishonest & unloving expressions. And both yin & yang are deeply complimentary with each other. Standing meditation & tai chi qigong moving practices can be beautifully enriching and challenging in their own ways. such as those with one leg raised above ones head, or inverted. qualities available in consistent, appreciative tai chi qigong & zhan zhuang practice. Approaching these practices from more more than just a physical & external movement focus is important. to enjoying & benefiting from these seemingly simple qigong practices. common to some systems of practice are not emphasized. stance training & related practices. Classes typically focus on opening into zhan zhuang for a core duration of class. experiential feeling embodiment of principles inherent within any movement. the classes I teach do not focus on long, prearranged forms. through zhan zhuang and single and short sequence flows is deeply enriching in its' own ways. This also supports feeling & transforming layers of assumptions, biases & tension inducing inner noise. individuating, kindred & creatively exploratory soul & unitive consciousness. are not relevant to these arts and classes, as I practice and teach them. are distractions. It is not a competition. nourishing ones' own being & life in the eternal now. With appreciation, love, honesty, healthy exploratory growth and harmony.
" A deep sense of love and belonging is an irreducible need of all people. We are biologically, cognitively, physically, and spiritually wired to love, to be loved, and to belong. When those needs are not met, we don’t function as we were meant to. We break. We fall apart. We numb. ​We ache. We hurt others. We get sick. " 999 Anderson Drive San Rafael, Ca. 618 B. St. San Rafael, Ca. for more information and to join classes.
" True listening is another way of bringing stillness into the relationship. When you truly listen to someone, the dimension of stillness arises and becomes an essential part of the relationship. But true listening is a rare skill. ​Usually, the greater part of a person’s attention is taken up by their thinking. At best, they may be evaluating your words or preparing the next thing to say. Or they may not be listening at all, lost in their own thoughts. "